Older preferred stocks are being redeemed by their issuing companies at a record pace. No less than 17 CDx3 Preferred Stocks (the high quality issues that meet the ten selection criteria from chapter 7 of my book, Preferred Stock Investing) are going to be redeemed during July, starting with STI-Z from SunTrust on July 11. With all of these calls, many preferred stock investors are going to be looking to replace their called shares. The challenge at the moment is that market prices for high quality preferreds are relatively high. Buyers of such preferred stocks are seeing many prices above the $25 per share par value. Since purchasing shares above the $25 par value exposes investors to the possibility of a downstream capital loss in the event of a future call, many are rightly reluctant to purchase shares above that price point. 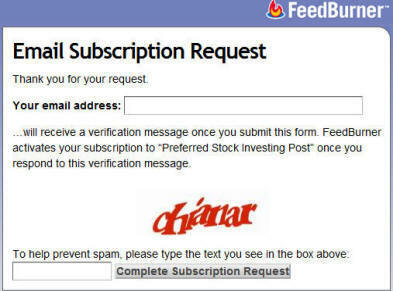 Many preferred stock investors are therefore currently faced with either (a) purchasing higher risk preferreds at a sub-$25 price or (b) paying above $25 for higher quality preferred stock shares. As mentioned in the below "Preferred Stock News" article, there is a "double-dip" technique that allows a preferred stock investor to have the best of both worlds - use the proceeds from a recent redemption to purchase shares of another high quality preferred stock without realizing a net capital loss in the event of a future call. Let's say you own shares of BBT-B, a trust preferred stock from BB&T Corporation that has been called for July 18, 2012. BBT-B pays quarterly dividends of $0.60 per share on the first day of February, May, August and November for the quarter that just ended the prior day. Since BBT-B has been called for July 18, BBT-B's final quarter is a partial period for which shareholders will receive a partial dividend of $0.52 per share. This final partial dividend covers the period May 1 to July 18 as shown in Figure 1. 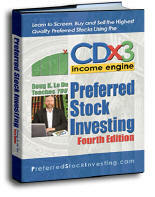 The CDx3 Notification Service website (my preferred stock email alert and research newsletter service) provides subscribers with the ex-dividend dates of all preferred stocks and exchange traded debt securities trading on U.S. stock exchanges plus a special "Ex-Dividend Calendar" that lists the upcoming ex-dividend schedule for just the highest quality issues (see example here). Looking at the current (July 2012) schedule allows subscribers to see the upcoming ex-dividend dates for this month. Remember, those who own shares of a preferred stock on the morning of the indicated ex-dividend date will receive the upcoming dividend payment for the entire 90 day quarter just ended, regardless of your purchase date. That means that if you use the proceeds from BBT-B's July 18 redemption to purchase shares of another high quality preferred stock that has yet to reach its ex-dividend date this month, you will receive two dividends (one from BBT-B and the second from your new shares) for the same period. Looking at the example shown in Figure 2 (using "PFD-A" as a fictitious trading symbol for reference here), we can see that PFD-A will reach its upcoming ex-dividend date on July 25 (a week after you get the redemption cash from BBT-B). Note: If you are a subscriber to the CDx3 Notification Service, you can find this same example, complete with the actual trading symbol, on page 6 of the current (July 2012) issue of the subscriber's newsletter, CDx3 Research Notes. PFD-A uses the same dividend payment schedule as BBT-B. So as long as you purchase shares of PFD-A prior to its upcoming July 25 ex-dividend date, you will receive the upcoming dividend for the period May 1 through July 31. That dividend payment from PFD-A will cover the same date range (May 1 through July 18) that BBT-B has already paid you for; you get paid two dividends on the same principal. That's the double-dip. As illustrated by Figure 3, even though you will pay more than $25 per share for PFD-A ($25.38 in this example), you have already been reimbursed (in advance) for the risk of a future capital loss by this double dividend payment. 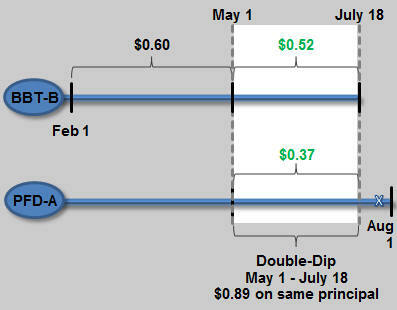 By using the double-dip technique as described in this example, preferred stock investors can shop for purchase candidates that are priced above their $25 per share par value, greatly increasing the number of high quality preferred stocks available to you in today's market. Just be sure that doing so is consistent with your personal goals, resources and risk tolerance. Already a subscriber? The trading symbol for this example is listed on page 6 of the current issue of the subscriber's newsletter, CDx3 Research Notes. (Already a subscriber? 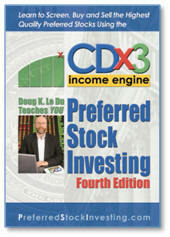 For actual symbol see page 6 of the July 2012 issue of CDx3 Research Notes). Beginning on July 11, 2012, and for the 90 days that follow, preferred stock investors are going to see a significant uptick in their brokerage cash account thanks to a Thursday, June 7, 2012 announcement by the Federal Reserve. The June 7 Fed announcement opened the "premature call window" for 90 days, triggering a multitude of trust preferred stock (TRUPS) redemptions from our publicly traded banks. With the premature call window now open (for the second time since July 2010), all bank-issued TRUPS are now redeemable regardless of the call date that is published in their prospectus. Companies are required to provide a minimum of 30 days notice when they redeem ("call") a preferred stock. SunTrust was the first to react on Monday, June 11, redeeming its STI-Z TRUPS for July 11, 2012. If you own shares of STI-Z, SunTrust is going to buy your shares back from you on that date, the proceeds showing up in your brokerage cash account. Citi and JP Morgan were quick to act as well with TRUPS redemptions (see list: Citi | JP Morgan). Citi is redeeming just under $5 billion of their TRUPS while JP Morgan is calling $9 billion worth. The following day KeyCorp prematurely called KEY-F ($0.7 billion) for July 12 followed by BB&T Corporation on Wednesday, June 18 calling BBT-A, BBT-B and BBT-C (valued at $3.1 billion) for July 18. Bank of America, with over 70 preferred stocks, weighed in on Friday, June 22, calling 11 TRUPS (see list) for July 25, 2012 valued at $3.9 billion in response to the Fed announcement. 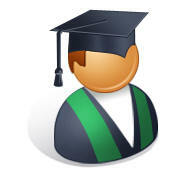 PNC Financial (PNC) was the last June announcement, the bank redeeming PNH and NCC-C for July 30, 2012. These two TRUPS redemptions will deliver another $1 billion into the cash accounts of preferred stock investors during July. Standard TRUPS prospectus language allows banks to redeem their TRUPS, regardless of their published call dates, within a 90 day period following a "capital treatment event" (which the Fed's June 7 announcement was). Because these TRUPS redemptions are being triggered by the same June 7, 2012 event, many billions in cash are going to land in the cash accounts of preferred stock investors within the 90 day period beginning on July 11 with STI-Z shareholders. High quality preferred stock market prices have been relatively high this year, initially caused by several simultaneous redemptions of very widely held REIT-issued preferred stocks. During the second quarter, investors fleeing eurozone assets added additional upward price pressure on high quality U.S. assets. Going into the third quarter, the Fed's June 7 announcement is going to create a large group of suddenly cash-rich preferred stock buyers, beginning July 11 and for the 90 days that follow, all looking to replace their redeemed shares simultaneously. Consequently, while it is not possible to know in advance with certainty, preferred stock investors should expect additional short-term upward pressure on the market prices of preferred stocks beginning July 11, 2012 that would not have been there otherwise. During this period of high prices, preferred stock buyers are frequently faced with having to pay a market price above $25 (par) in many cases. Paying a market price above $25 per share, while increasing the number of alternatives available to pick from, can expose you to the risk of realizing a capital loss in the event of a downstream call (since shareholders will receive $25 from the issuing company in that event). But what if someone else reimburses you for that risk? One way to help mitigate the risk of a capital loss that comes with purchasing shares above $25 is to use the "double-dip" technique. Those holding shares of a redeemed preferred stock receive a final dividend payment for the final quarter through the redemption date. By using the proceeds from the redeemed shares to purchase a preferred stock that has a dividend payment for the same period coming up, the shareholder gets paid twice for the same period on the same principal. 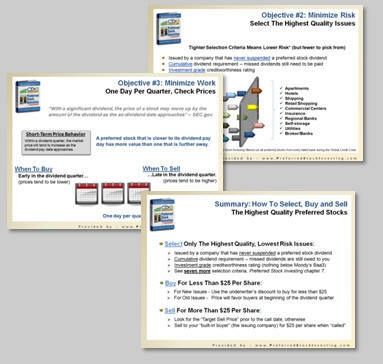 The above "High Quality Preferred Stocks" article provides an example of how to do this. As TRUPS redemption dates arrive between July 11 and early-October, tens of billions of new dollars are going to be distributed to preferred stock investors. These cash-rich buyers are going to enter the market during the same 90 day period looking to replace their called shares and, hence, put additional upward pressure on preferred stock market prices. By using the double-dip technique, a preferred stock investor can be reimbursed for the risk of a downstream capital loss when purchasing shares above $25. There are exceptions to the 90 day limitation language. Some banks removed this limitation from their TRUPS prospectuses when the securities were originally issued. TRUPS without the 90 day limitation language in their prospectus become callable, and remain callable, whenever a "capital treatment event" occurs. Check the prospectus to see if your TRUPS shares will remain callable beyond the 90 days following June 7, 2012.